The school's Harvest Festival Service was held in the Methodist Church with a collection in aid of The Dragonfly Foundation - a charity which raises money for a school in India. The Church was at bursting point, every child contributed and it was enjoyed by all. A successful and highly informative reading and phonics information evening for parents was held by Mr Barwick. Parents were shown how we teach reading in school so that they can support their child at home. To mark the centenary of the end of WWI children made a waterfall of 100 poppies which was displayed in the school hall. A Remembrance Service for parents and villagers was held at school with a roll of honour being read out in memory of pupils' and staffs' relatives who lost their lives in conflict. 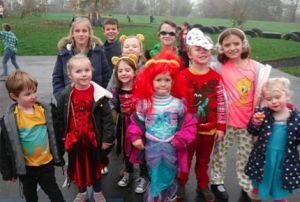 The School Council organised a crazy non-uniform with fun activities day in aid of Children in Need - lots of fun raised for a good cause. The Friends of Husthwaite School held a Smartie Tube Challenge - children had to fill Smartie tubes with 20p in return for doing a good deed or small job for family/friends/relatives. The class who raised the most money will be rewarded with a prize. Children were encouraged to wear odd socks to school in recognition of Anti-Bullying week. Odd socks represented children being able to express themselves, celebrate their individuality and recognise what makes us all unique. The school hall was turned in a restaurant as parents and relatives joined children for a family school lunch. Class 3 enjoyed their termly visit to PrimeTime at Husthwaite village hall to join in games of Boccia and Kurling. Mrs Bucknole, the school cook, cooked a delicious roast dinner for the Orchard Village Club this month which was very well received by the club's members. hours per week. Please enquire at the school office. The application process for children starting reception class in September 2019 is now open. Parents need to apply online by 15th January on the North Yorkshire County Council website. We welcome visits to our school. If you would like to arrange a visit, please contact Sarah Dixon for further details on 01347 868371.